This is a live transcript of the presentations made at last week’s Event Cinema Association conference held in London. As such we sometimes paraphrase what is said on stage and any errors are most likely the fault of the note taking and not the speakers. 100% coherence is not possible as we often include both what is spoken and shown on screen. While all three were interesting topics, it was not possible to split myself up, so the choice was made to hear about gaming, or eSports in cinemas, presented by Corinne Thibaut (only half-jokingly introduced as “the Queen of Cinema”) and Alban Dechelotte, responsible for Music and Gaming at the Coca-Cola Company. Corinne and Alban then gave some eye-popping statistics about the size of the global gaming market (see photo above). Key passion points for teens [are]: soccer, gaming, music, movies. eSports – The main point is not playing but watching. 50 euro tickets to watch League of Legends (LoL) sold out in less than 5 minutes. Beating Rolling Stones and other big acts in the same arena. League of Legends has 80 million monthly players and 25 million weekly. [It is] Modelled on the NBA tournament. World Final [is held] this week. Wembley, yesterday, Brussels next week, and finale in Berlin in a month. Deal with Riot [the LoL organiser] – “Coke don’t have to pay for right but delivers a high class event that delivers a unique experience to fans,” in cinemas. Targeted communication – localized in 8 languages – promoted across Riot’s channel. Including the client, the patcher [? ], social media, and LOL website. “Also the Reverse Feed, with GoPro camera you could see what is going on in cinema and include that in the global stream. Exhibitor doubted if people would come at 7am in Marseille on a Sunday morning. [which is when the LoL tournament kicked off in South Korea] But they did. In droves. Not using satellite but internet for 5 hour event – with 5 intermissions. 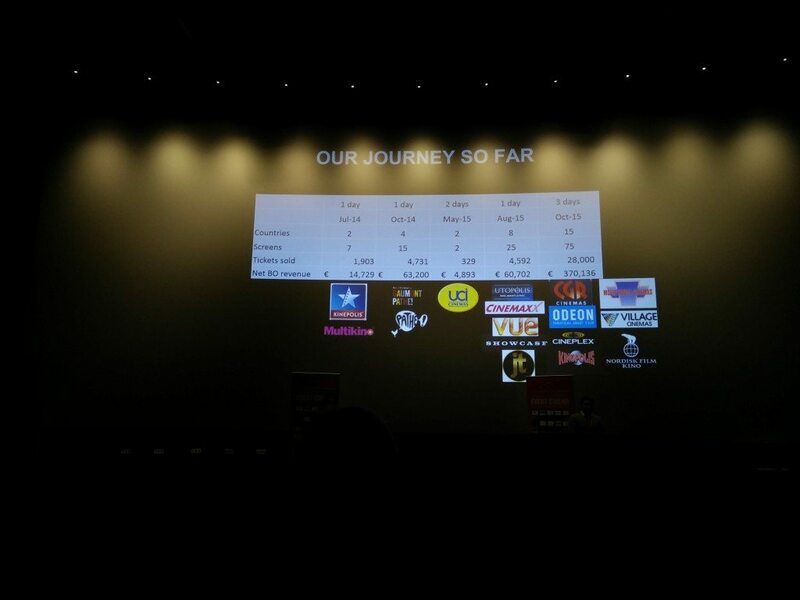 Corinne and Alban finished by putting up a slide of ‘Our Journey So Far’ that gave the stats of the cinemas involved. Question: What about using satellite to deliver the stream? Question: Can any cinema join? Question: What is the pricing policy? And with that we came to the end of fast but informative session on the cutting edge of event cinema. Apart from Coke and Vue, which has created a dedicated eSports auditorium, nobody else is doing this in a major way – yet.